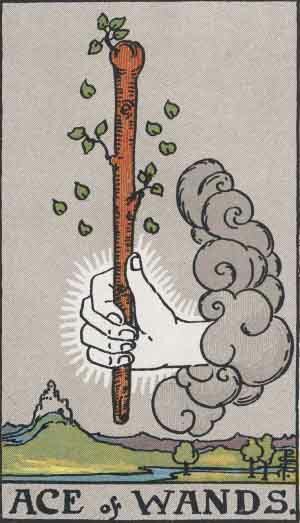 The card shows a right hand holding a wooden stick with branches and leaves. Some of the leaves are falling. In the background one can see a river running under a hill, upon which is a castle. This card is often used to represent Spring and the direction of south. It would be a good card to turn up in case of a question relating a new business or endeavor. But this card is related to the work or the project itself, not the profitability or financial matters relating to it. For that one needs to look at the surrounding cards. The Wands Tarot Card Suit relates to the career and the view towards the career. Therefor it’s possible that the cards are indicating the Questioners ideas about his career, rather than actual career relating matters. Because of this, the card could symbolize the birth of an idea of a business venture in stead of being the business venture itself. The idea may be there, but it’s up to the individual to act on it or not. Though this suit relates primarily to the career, sometimes the ace may foresee a birth of a child. This interpretation is totally dependent on the surrounding cards. The Ace of Wands may also indicate a new beginning, but some issues might be at hand. It might be a sign of a false start or ideas not pursued. It might indicate in some cases, problem for women in relations to men. Depending on the surrounding cards, this card could mean difficulties concerning sterility or barrenness in relation to childbirth or the Questioners wish to become pregnant. This of course is more of an issue in a woman’s spread, though it might turn up with a man, if he and his partner are trying to have a baby. New beginning, new ideas. New business opportunities to be pursued. Birth of a child. False start, ideas not pursued. Barrenness or sterility in relation to child conception.